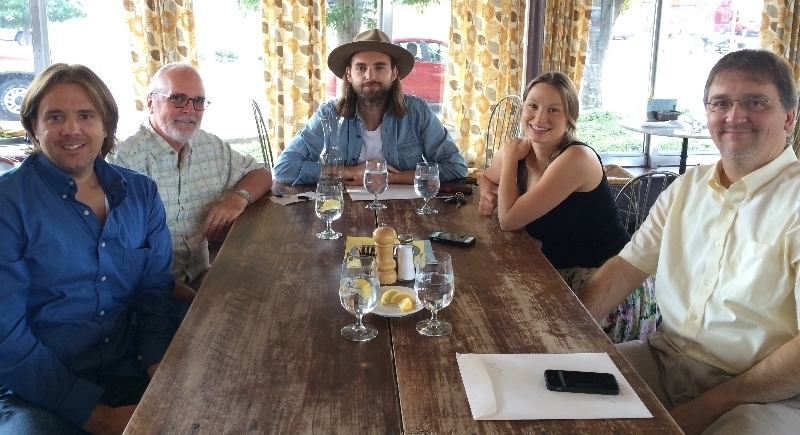 After signing his record deal, Sam celebrates with (clockwise from left): agent Lance Roberts, Brash-Records CEO Steve Jones, manager Stephanie Hudacek & attorney Matthew Beckett. August 13, 2014 — Nashville singer/songwriter Sam Lewis has signed with Atlanta-based record label Brash Music. Sam is thrilled to bring his signature brand of acoustic soul to the rich and diverse roster of Brash artists. In conjunction with his Brash Music partnership, Sam is set to enter the studio this month to begin recording the follow-up release to his critically acclaimed self-titled debut. The new album will be produced by renowned roots-music maestro Oliver Wood (The Wood Brothers, Tedeschi Trucks Band, Kathy Mattea, Shemekia Copeland) at Nashville’s Southern Ground Studio. “I am thrilled to be partnering with Sam,” says Brash Music CEO Steve Jones. “The dynamic message in his songs directly mirrors the soul in his heart. He is special and it’s an honor to be a part of his team.” With Brash, Sam will write the next chapter in his journey—sharing his heart, soul and his inspiration with everyone that will listen. CHECK OUT THE EXCLUSIVE COVERAGE READ FULL ARTICLE FROM NODEPRESSION.COM ! At Brash Music, Steve Jones and Company strive to be a true independent record label, forever foraging for talent in all genres, and providing an atmosphere that breeds creativity. The opportunity to record with Oliver Wood, most notably one half of the Wood Brothers (the other half is his brother, Chris, of Medeski, Martin, & Wood fame), is a homerun for any artist — second album on a new label aside. Wood has produced records for the Wood Brothers and Kathy Mattea, as well as Susan Tedeschi and Derek Trucks’ last album. About Brash Music: Brash Music is an eclectic independent record label based in Atlanta, and founded on the belief that opportunity in the music business lies between a vast, eager talent pool and a need for fresh perspective. Brash addresses that need by operating from a set of core values that emphasize our commitment to integrity, transparency with our artists, innovation, efficiency and financial prudence. Brash’s mission is to passionately deliver quality music in a way that’s profitable for all involved.